← The news is too much with us. After nearly 5 years, Sara’s dolly had started to talk. Sure, Sara talked to it, dressed it, gave it a name. She even pretended to feed it cookies and tea every Sunday afternoon. She’d even thought she’d heard it answer her before, but it was always in her head or her heart. It was never out loud. The first time she heard it out loud she thought she was imagining it. The second time, just a moment later, she thought her older sister Janey was playing a trick on her, throwing her voice. It was just like her to torment her little sister in ways that she could easily deny later to their busy and no-nonsense parents. Sara had learned early on that if she brought up charges, there had better be proof or the punishment she expected Janey to get would fall on her. She’d also learned that it was best to settle matters herself right away. Sara jumped up off the bed, scattering her coloring pages and crayons and scrambled to her bedroom door. She jerked back the door, expecting to see her sister’s back as she ran away. But nobody was there. The hall was empty – not even the sound of bare feet dashing away. Stunned, Sara went to find her sister. After a few minutes she found her outside on the hammock reading some book with dragons on the cover. There was no way Janey could have gotten there that fast. Sara slowly walked back to her room via the kitchen, helping herself to a piece of banana bread and a glass of lime Kool-Aid. She did all her best thinking when she had a snack. As soon as she sat down on her bed, with her dolly nestled in her lap, she heard it speak again. “Won’t you give me some of your snack?” The voice was so soft and so sad, so full of loss and longing. Sara held the doll out at arm’s length and stared at it, blinked her eyes. Then, with slow horror, she watched her doll blink her eyes too. 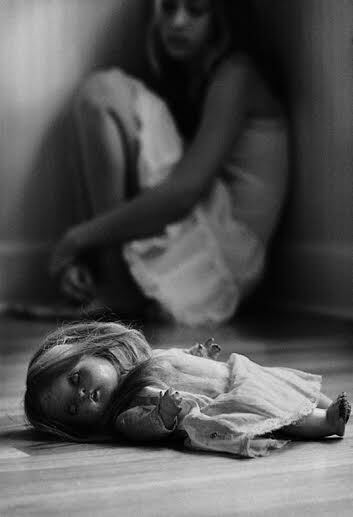 Sara threw her doll into the middle of the room and retreated to the furthest corner, curled up into a ball. It was nearly half an hour later before she realized her mistake – the doll was between her and the door. How could she escape? She put off the decision a little while longer, but soon she realized she had to pee and there was no ignoring that. It was either creep past that accursed doll or go here in the corner. Even though she was young, she knew that would be a bad idea. Even if her Mom didn’t find out soon and punish her for it, Sara would smell the sickly sweet smell of her dried urine whenever she was in her room. Going to sleep would be terrible. She had to risk it. Keeping her eyes on the doll, she slowly got up so as not to startle it. As slow as a cat stalking a cricket, she moved around the edge of the room as far away from her former best friend and confidant as she could. She had told it everything. All the things she couldn’t say out loud to her Mom, her sister, her friends, she told the doll. All her fears, all her failings. Every little sneaky thing she’d done to get back at her sister without her knowing. She’d poured all of her darkness into this doll, and none of her joy. The slow realization of what this meant descended upon her like an evening fog, clouding her vision, narrowing it to a pinpoint. She knew with dreadful certainty what she had to do next. She must destroy the doll. So far, there was no movement from the accursed thing, but she couldn’t be sure this would continue. She’d thought it would stay silent for all those years, but that had changed. What other horrible changes would happen? Just because it wasn’t moving now didn’t mean it wouldn’t start, and soon. She had to destroy it as quickly as possible before it ruined her life. She closed the bedroom door behind her and dragged a chair from her sister’s room to jam up under the doorknob. That would buy her some time to think of her plan. She almost forgot her need to use the bathroom in her fright, but she took care of that now. While in the calm and quiet space of the hall bathroom, she considered her options. Burial wasn’t good. Her Mama would get mad about the mess she’d make, and how could she be sure the doll would stay buried? It might dig itself out. Perhaps she should chop it up first. Then she realized if she did that she could put all the pieces in separate places around town. The head could go under the drainpipe of the neighbor’s house at the end of the block, an arm in the trashcan in her school’s bathroom. There’s no way it could reassemble itself then. But maybe the head could still talk, she realized with a cold shudder. She’d better bury it, at least, to be sure. Burning it was right out. Her Mama would whip her if she caught her playing with matches again. She’d gotten in trouble for that when she was three, having set a flip-flop on fire, wanting to see how the rubber melted. It melted alright, and so did the carpet it was on, and the curtains, and the entire bedroom. The whole family had to stay in a motel room for nearly 4 months until the insurance company got the restoration work done. While it was an adventure for the girls, it was a headache for the parents, so they made sure that Sara understood they were not kidding about fire safety. Janey used it as yet another way to torment her little sister, who she never wanted in the first place. Anything she could do to get her to leave her alone, or even leave, was fair game. This was proving to be the hardest thing Sara had had to contend with in all her tender years. Maybe she could preempt the doll and confess all her slights and sins to her mother before the doll did. Just thinking about that made her stomach go icy cold and wobbly. There were a lot of things to confess. You or I would consider them trivial, but Sara, with her limited experience, thought them worthy of eternal damnation. The perspective that comes with time downgrades childhood sins to summer showers instead of the tornadoes that they seem to be at the time. She had plenty of time to learn what real sins were about, but as for now, she felt damned. But she didn’t have plenty of time to figure out what to do about the doll. So she did what she was taught to do in Sunday school. Not like she did a lot, but she figured it couldn’t hurt to try. Sara wasn’t sure she had a good connection, because she couldn’t hear God’s reply. Was praying like talking on the telephone? Sometimes when she was talking to her grandmother in Canada the connection wasn’t that good. Also, often Gram’s hearing wasn’t that good either. Her mother always told her to keep on talking anyway, that Gram could make it out. Maybe God was the same way? It was worth a try. It wasn’t like she had anybody else she could call. This was some big stuff. She needed to go straight to the top. Sara heard a voice so quiet that she ignored it at first. It was centered in the middle of her chest, about heart high, and not in her ears. She didn’t hear it so much as feel it. The feeling-voice said to do nothing at all, to not destroy the doll, to not say anything at all to her parents about it. To act as if everything was normal. This seemed too easy, she thought, but precisely because it made no sense she decided it might actually be a message from God. She would never have come up with this on her own. And, if nothing else, it required almost no effort on her part. It was going to be difficult to pretend everything was fine when it most certainly wasn’t, but if God insisted, there must be a good reason. She decided to play along. The doll said nothing the next day or the next one after that. It was nearly a full week later before it spoke again, and this time it was around Sara’s Mom. She was straightening up Sara’s room one morning and the doll suddenly started to talk, as clear as you please, staring straight at her. Sara’s Mom stopped making the bed and stood stock-still, refusing to turn and face the voice. It sounded just like her mother, who had been dead for 18 years, long before her children were born. In fact, she realized suddenly with a guilty shudder, the anniversary of her death had been two weeks ago and she had forgotten. She usually remembered, usually dreaded that day. Her mother had been the model of motherhood in public – PTA chair, Girl Scout troop leader. She even had started her own nonprofit tutoring business to teach all the recent influx of immigrant children and their parents how to read and write in English. Three times in her life she had gotten the coveted “Citizen of Lewisburg” award given out at a huge gala once a year. Only Laurie, Sarah’s mom, knew the truth. Only she knew the true evil that lay beneath the façade that everyone else saw. Only she knew how twisted and damaged her mother was, yet because everyone else saw her as a saint, nobody believed her when she asked for help. She tried to tell her teachers about the emotional and mental abuse she suffered from her but they never listened for long, thinking Laurie was making up a story. “You’re so creative!” they’d exclaim, and encourage her to write for the fiction column in the school newspaper. “But try to write something nicer next time, honey. Girls don’t write scary stories, do they?” they’d suggest. After a while, Laurie chose to be silent about the abuse. Her mother was clever. It never was physical. There never were bruises or scrapes. Even if there had been nobody would have believed her anyway. She didn’t dare look at the doll, but she didn’t dare turn her back to it either. It kept speaking, kept taunting her. It had chosen well. Nobody else was home. Nobody else could listen in. She could keep digging in, taking up where she left off 18 years ago. Laurie was deer in the headlights frozen, speechless. For the longest time the doll kept talking and Laurie listened, breathless, immobile. After an eternity, the shallow breaths she had been unconsciously taking caught up with her and she suddenly drew in a huge breath to make up. It was then that she recovered her power. Without a word, she snatched up the doll by its arm from the corner chair it was in and carried it to the nearest trashcan. Without a word she swept up the handles of the brown plastic Kroger bag she used as a trashcan liner and tied them shut. Without a word she scooped up the rest of the trash in the house, put it all together in a huge black bag her husband kept for cleaning up after yardwork, snatched her car keys that were hanging from the hook by the front door and marched straight out to her car. Within 10 minutes she was at the city dump and the deed was done. She was still shaking by the time she got back home. After a little internal debate, she decided to go for a quick walk around the neighborhood first and then have some linden tea. Yes. That order seemed best. Time to shake out some energy and then brush away the crumbs. Sara got home from school and went straight to the kitchen for a snack. She took her gingersnaps and lemonade to the porch to enjoy. Normally she would go straight to her room to share it with her dolly, but after it had started to talk she had changed her ways. She spent as little time in her room as possible now. She couldn’t bear to think of it staring at her while she slept. She was sure her teddy bear and stuffed giraffe could protect her from it, but she didn’t want to risk them being harmed in the fight. Plus it wasn’t fair to ask a doll to fight against another doll. It was against their code, after all. But then she soon remembered that she planned to color after school today, and her crayons were in her room. There was nothing for it except to do it, so she got up and went to her room. Waiting was only going to increase her dread and make it harder. Best to get it over with. In the past week she had learned to not look in the corner chair where she had put her dolly after that terrible day. So she almost missed that it wasn’t there. A wave of terror like ice water poured over her when she noticed its absence. Where was it? Had it finally started to walk? Had it talked to her Mom and told her everything and she was now going to be interrogated? Sara remembered the still small voice she’d heard when she prayed for guidance a week ago. Don’t worry about it, act like everything is fine, it said. So she pulled herself together and gathered up her crayons and coloring books and went back to the porch. By then her Mom was there sipping her tea. Their eyes met and both smiled awkward, guarded smiles. Something passed between them – a truce? An understanding? For the rest of their lives they never talked about the missing doll. This entry was posted in Stories and tagged bad parents, black and white stories, creepy doll, horror, possessed doll, short story. Bookmark the permalink.